Enjoy the peace of mind provided by battery storage. Install more solar on the maximum inverter allowed by TEP and use the battery to store excess produced during the day and discharge it in the evening, increasing your savings. Use batteries to reduce energy used in the home during costly 'Time of Use' periods, or take advantage of 'Demand Based Rates' by discharging the battery when home usage is high. Power a mini split, important appliance, or your computers independently of the grid during an outage. Utilize energy generated from solar rather than selling it back to the grid at a lower value rate. Use batteries to reduce energy used in the home during costly 'Time of Use' periods, or take advantage of ‘Demand Based Rates’ by discharging the battery when home usage is high. + Do you have the Powerwall? Yes! 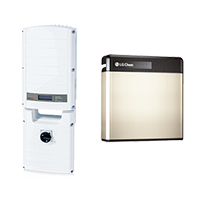 We are a Tesla certified installer for the Powerwall and have supply available for our customers. Currently, battery systems we offer tend to range from $10,000 to $20,000. We carry and install a range of brands to fit the needs and budgets of our customers. + What can I power with battery? While capacity is based on the exact system installed, the average installation will generally power a mini split AC, an important appliance such as a refrigerator, and your computer(s). + What warranties are offered? Battery systems sold by TFS come with a 10-year manufacturer warranty, as well as TFS's 10-year workmanship warranty.